This lithograph, printed and signed in 1955, is of the painting Les Demoiselles d�Avignon by Pablo Picasso. The painting itself, which hangs in the Museum of Modern Art in New York, has long been identified as the first cubist painting, and has inspired numerous pieces of art. Picasso started the work in 1906 after moving from his home in Spain to Paris. There, after mastering classical forms of art, Picasso began his search for new ways to represent form. The result was Les Demoiselles d�Avignon. This piece has a colorful history. The image depicts five prostitutes in a brothel on Avignon Street in Barcelona. Originally the painting contained two male clients and Picasso�s focus was on the interaction between the men and the three prostitutes. However, by its completion Picasso had eliminated the two men and chose to solely focus on the simplicity of the setting and the women within the space. He replaced the two male figures with two females. Picasso fully immersed himself in finding new ways to represent the five female figures in their profession. The faces of the five prostitutes become the focus of the painting. Picasso breaks apart the female form, fracturing their shapes and interlacing them with the equally jagged background that stands behind. In doing so, Picasso creates a tension between representation and abstraction. Picasso�s three earlier women have rather stoic faces. Their bodies are much more recognizable as female. The two figures on the right demonstrate much more abstraction as their flesh is more severely diced into fragments amidst the background. As Picasso became more comfortable in his new style it is obvious that he continued to push the idea of the abstract female form even further. Picasso looked to ancient Iberian sculpture from his home country and other primitive forms of art for inspiration. During the height his career, museums emerged across Europe dedicated to these non-western arts. Picasso was an �enthusiastic� collector of primitive art. Many Avant-Garde artists �reveled in the energy and freshness of non-western images and forms. 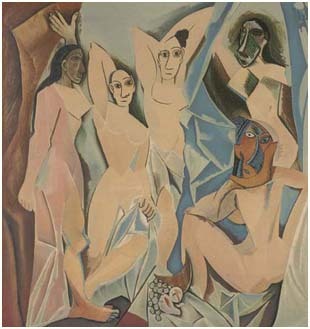 These different cultural products provided western artists with new ways of looking at their own art.� The three female figures on the left show direct correlation to Picasso�s interest in Iberian Sculpture, while the two on the right demonstrate Picasso�s later attraction to African masks. Les Demoiselles d�Avignon stands a revolutionary piece that changed the world artistically. It opened doors for artists to start expressing the world through a voice that was uniquely their own.